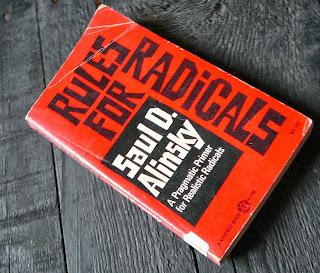 Saul Alinsky’s “Rules for Radicals” has become the bedrock of the modern left. It’s a morally bankrupt doctrine that aims to demoralise anyone that stands in the way of progressing towards collectivism. This is primarily achieved by exploiting useful idiots that have little capacity or desire to think critically, as demagogues pull their strings. RULE 1: Power is not only what you have, but what the enemy thinks you have. The aim is to make others believe that you have more power, and thus influence, than you actually have. Appeals to popularity are often how this occurs, by stating that “you’ve lost,” or that “most people are against you,” for example. Whether this is true or not (and often it isn’t) is irrelevant. Perception is everything. COUNTER: Power is the obsession of the impotent, and this weakness can be turned against you. People obsessed with power are inadequate. If you focus on this weakness you will force them to face their fears. They will try to rationalise this psychological state with a sense of grandeur, entitlement, or victimhood, but are merely excusing their own lust for power that they can use to dominate others. Do not be afraid to point out this hypocrisy, for this will expose their insincerity. RULE 2: Never go outside the expertise of your people. Alinsky spent most of his time working with people of limited knowledge and critical ability, though they were still highly emotionally driven. Alinsky bypassed this ignorance by turning emotionally animated individuals into a harrying mob. COUNTER: If people are ignorant then always point out why. If people come across as ignorant then always point out why this is the case. Use this as an example for why such people are incapable of understanding what’s best in a given situation. RULE 3: Whenever possible, go outside the expertise of the enemy. Alinsky liked to throw people off-guard with distractions. It didn’t matter to Alinsky that these tactics were often attempts to derail and confuse, rather than enlighten. All that mattered is that his objectives were met, often by exhausting the opposition with fallacious points like straw-men or muddying argumentation. COUNTER: Do not be distracted by anything irrelevant. If you’re constantly being barraged by irrelevant tactics then refuse to cooperate. Do not feel the need to play along with anything that has no bearing on the core issues at play. Alinsky was a consequentialist that had no regard for objective principles. He turned people’s morals against them by holding them to their own standards, while bypassing these morals himself because he did not consider them important. This made it easy to exhaust people with morally relative dishonesty. COUNTER: Only stick to rules that others respect. If those assailing you have no respect for your values do not feel you are unable to defend yourself accordingly. While any response should never be excessive, and should never harm the innocent, you should always be prepared to give as good as you get. RULE 5: Ridicule is man’s most potent weapon. This is a strategy to undermine through character assassination. It doesn’t matter to the Alinsyite if this is merely a distraction and a form of ad hominem. What’s important is that you make the opponent feel incompetent. COUNTER: Ridicule is a double-edged sword. Ridicule is often a front for inadequacy. If people use it against you then make them look into a mirror. Combine retaliatory humour with points that expose gaping flaws in the arguments of those hiding behind ridicule, and make them appear foolish and irrational. This alludes to the fact that usually if people had fun then they are more likely to take part in any activities. This approach also provides a platform to indoctrinate participants of any events, especially those that might not be aware of a true agenda. COUNTER: Turn enjoyment into a chore. By putting up a good fight you will make the opponent struggle, making it difficult for them to enjoy themselves. RULE 7: A tactic that drags on too long becomes a drag. Keeping things fresh is what Alinsky was aiming for here. He did not want anything to drag on too long. This causes boredom, which is harmful to momentum. COUNTER: If someone is being evasive then make them face up to what they are avoiding. If you find that there are certain issues others are avoiding then there is a reason for this. Therefore it pays to keep backing them into a corner until they have no choice but to address this. RULE 8: Keep the pressure on. Never let up. By continually trying new strategies Alinsky would exhaust his opponents. He’d attack from lots of different angles, demoralising the opponent due to the sheer volume and variety of tactics involved. COUNTER: Choose you battles wisely. Don’t allow others to force you to engage them when the battle is not worth fighting, or you are caught off-guard. Control momentum, and make others engage you on your terms. RULE 9: The threat is usually more terrifying than the thing itself. Exaggeration is the key here; Alinsky appealed to the fears of others, to make them give in to his demands. Again, it doesn’t matter if any of the claims made are true. What’s important is that people believe they are. COUNTER: Never let emotions control you. Always rationally consider any threats you are faced with. Be sure that your fears are real and never over-react to a problem. RULE 10: If you push a negative hard enough, it will push through and become a positive. In other words Alinsky antagonised the opponent until they reacted, and played the victim when they did. This is typical professional victimhood. People like this know how to goad others into reacting, and capitalising on this to gain sympathy. This is a form of bullying that is often missed by the zeitgeist we presently live in. COUNTER: Always point out the hypocrisy of a professional victim. Professional victims are the first to intimidate and antagonise. Point this out at every opportunity, so the more rational among us can see through their façade. RULE 11: The price of a successful attack is a constructive alternative. Never let the enemy score points because you’re caught without a solution to the problem. By making compromises in the short-term the Alinskyite makes sure that long-term goals are met. This compromise won’t stop the ideological progression with every appeasement in the Alinskyites favour. All these concessions will stack up over time. COUNTER: Never compromise with your unalienable natural rights. Never compromise with anyone that wants to erode your unalienable natural rights. Do not allow the slippery slope to totalitarianism to ensue by making concessions that gradually erode your natural freedoms. This is Alinsky’s most vicious strategy. He would destroy people in any way he could, and isolate them from any support structure they might have, like friends, family and colleagues. Alinskyites try to turn everyone against a singular target, and make them into a pariah. A very cruel strategy implemented time and again by leftists and other moral relativists. COUNTER: Fight fire with fire. If someone is determined to destroy you then you must be prepared to fight back with all your might. Again, never harm the innocent or over-react to a threat. But you should always fight fire with fire. If this includes destroying another person because that is what they are trying to do to you, then so be it. By showing those that would destroy you that you are prepared to give as good as you get, you will make them think twice the next time they decide to cross you. While these counter rules have been juxtaposed alongside Alinsky’s doctrine for the left, they will work in other instances of moral relativism. Always remember that you are not a doormat, and that you have no obligation to be a victim for sociopaths and psychopaths. Indeed. It's time we made a stand against those that have no honour or respect for virtue. Compromise is how they gradually turn us into slaves. E, did you hear that now Bill Price of The Spearhead has officially dumped Paul Elam and the AVfM gang? No I didn't. Please fill me in on the details. If you haven't heard of The Spearhead (the-spearhead.com), it's a popular manosphere blog owned and run by an American named Bill Price with various contributors. They publish commentary on social problems related to feminism. Price promulgated in most recent article, "Adios, Paul", his disapproval of Paul Elam and the AVfM/MHRM gang, their most recent action apparently being Elam agreeing to an interview with a mainstream media reporter about the manosphere. Elam and gang (per usual, they brought their trolls with them) caught wind quickly and unleashed their fury via the public comment feature. At least one of their jackals even sockpuppeted as Bernard Chapin, albeit extremely poorly for anyone who knows him. Comment fights continued and the thread currently has 266 published comments, which is very fast for The Spearhead considering that the article was published on the 18th. Your name was mentioned twice, but amazingly you weren't attacked, though Karen Straughan, a.k.a. GirlWritesWhat, disagreed with your channel's censorship policy. As usual the army of trolls you allude to were there. You cannot allow these clowns to have free reign because they will spam and concern troll to death, and derail any way they can. This is not a requisite of "free speech" Quite the opposite. Anyone that stands up to the extreme elements of the MRM is always harassed like this. it's funny to me that I am mentioned in relation to a very concise commenting policy regarding honesty and hostility, and yet Barbie, who has arguably the fastest block finger of all towards anyone that even remotely disagrees with him, is not. Another final point is this idea that I am against MGTOW without constant provocation. The main reason is very simple; the extreme elements now dominate the ideology, and no one will speak out because, frankly, they are scared of being bullied in the same way as the manner that the article by the Spearhead has been inflicted to. That's why MGTOW, like feminism, only has itself to blame for being targeted en masse due to it being full of either enablers of misogyny, or projectors of it. Exactly. It stuns me how intellectually lazy and dishonest so many commenters can be. To use your mention of free speech, they can't even be bothered to look up just a few rudiments about it. It really doesn't take that long before you find out that free speech doesn't necessitate absolutely free speech at all times everywhere. It's not like asking them to read War and Peace in a week, lol. But I guess these outcomes happen when the price of being irrational and wrong is zero (same thing with politicians btw). On commenting policies, yes, it definitely is weird that folks would dislike your or Chapin's policy, but say nothing about Barbie's. Good observation there. Maybe it's because a lot of the commenters are emotional and in no mood to be even handed. As for the MGTOW group, I could more or less agree with your evaluation. I always thought of MGTOW as just being an individual and having the courage to deviate traditional expectations in order to make wise choices, have better outcomes, avoid legal trouble, you get the idea. Over time, those who identify as MGTOW seemed to become more and more uniformly extreme and silly. But since I thought certain individuals seemed sensible and decent enough, I didn't dismiss MGTOW entirely. I don't want to name names, but as of late, it seems like even these relatively more decent MGTOW are, shall we say, pushing the reasonable boundary too far. Well at least you see the wood for the trees. Whether there can be enough people that end up rising up to the challenge of calling out the increase in Marxist ideology, anti-family rhetoric, and quite frankly outright misogyny in the MRM, I don't know. It's cost me a lot to try. But in the end it will only be the MRM that will suffer for such moral cowardice. I guess this is why identity politics is ultimately a complete and utter waste of time. It's the same old story whenever it's implemented. Rule 5: I tried to point out the idiocy to a self-hating Jew leftist of supporting Muslims and especially Syrian refugees. He tried to ridicule me by saying, "huh huh, Edwin, are you going to try to fight ISIS? Let's give Edwin a plane ticket so he can fight ISIS." So, I said, "how does it feel to hate yourself and be so uncomfortable with your Jewishness, to have so little pride, that you're willing to let people that want to kill you into the country?" Hey, what's good for the goose is good for the gander. If this stuff works for the left, make it work for the right.